The VisiSonics technology offers a real-time cohesive audio and visual data set which enables users to easily visualise noise sources. Audio Visual Cameras are available in either 5 or 15 HD camera configurations with 64 microphones. Cameras and microphones are distributed over the surface of an 8-inch diameter aluminium sphere. Spherical microphone architecture of the Audio Visual Camera allows the creation of an omni-directional panoramic scene. Microphone signals are digitised using a dedicated converter and then sampled at a frequency of 44.1 kHz. Field Programmable Gate Array (FPGA) collects the sampled audio and visual data and converts it to allow a single USB 3.0 data stream to be used. RealSpaceTM accepts this data stream and performs desired user functions in real-time. Each of the HD video cameras used in the Audio Visual Camera has a resolution of 1328 x 1048 pixels providing a high definition background on which to project the audio visualisation. The VisiSonics RealSpace Acoustic Analysis Tool (VRAAT) allows the instant analysis of recorded data by giving access to an integrated audio/visual panorama and useful graphs. 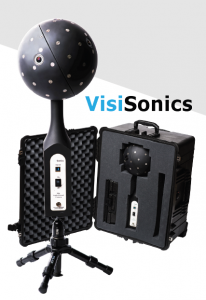 TotalSim are the UK distributor for VisiSonics equipment. The cameras are available for purchase or lease. If you are interested, please contact us at the email provided below. We have put together two videos which demonstrate the capabilities of the camera. If you’d like to book a demonstration or discuss with a member of the team your requirements, do not hesitate to get in touch at info@totalsim.co.uk or 01280 840316. Investigating the acoustic properties of one of TotalSim’s offices in Brackley. A Visisonics camera was used to test acoustic reflections. Our second video demonstrates Noise Source Detection.